In the research literature and case materials about partnerships and alliances, almost every author attempts to make a classification of partnerships based on the way they are organised. The table below is an example. Although such overviews are useful for analysing how a process of partnership formation can arrive at certain outcomes, they are less useful when you’re faced with the practical challenge of determining what a partnership should do in the first place. This is a design challenge, where new options and directions need to be created. How can we increase the size of our market with minimal investment? How can we enter new or adjacent markets with our product/service, without having to create one ourselves? How can we put our resources to use more efficiently, without growing our company further? What can we do to improve our existing competitive position? By using these questions together with the business model canvas, you can define the rationale for a partnership from your business model’s perspective. But the big question is how you will tie your business model together with your partner’s business model. You will need to make explicit how you will create and deliver value to your partner, as well as how you intend to capture value from your partner in return. It is at this second step of defining the value exchange with your partner, that the business model canvas falls short as design tool. You’ll break your mind over trying to tie the partnership rationale together for both your own, as well as your partner’s business model! Value exchange between partnering business models. The basic pattern here is that two business models are bound by a repetitive transaction of a good or service. The buyer appears as a customer in the vendor’s business model, because she’s buying a certain product or service from the vendor. The other way around the vendor will not appear in the buyer’s business model. Only their product or service appears in the buyer’s key activities or key resources, the cost for which is accounted in the cost structure.An example would be a food company buying ingredients from the world market. The ingredient is a key resource, but this can be acquired from multiple suppliers, who are technically interchangeable on an ad-hoc basis. A vendor relation turns into a vendor partnership, the moment additional value is exchanged on top of the transaction. This could be in an exclusive purchasing relationship, like the one between Samsung and Apple. In their early partnership in 2007, Samsung exchanged rights to exclusive procurement of flash memory, for the sharing of sales projections of Apple’s devices. In this case Samsung and Apple appear in their respective business models as key partners. The pattern that shows up here is a partnership based on reciprocal non-monetary value exchange between partners. Unlike the vendor relation, neither partner pays the other any money to exchange value within the partnership. This applies to partnerships like Spotify-Facebook, where Spotify gained access to the US market through Facebook, and Facebook was able to stream music through its channel. Also, Nespresso and its outsourcing of machine manufacturing to its partners applies here. Nespresso in effect gets free access to its partner’s channels, in return for co-branding the machines and providing a technology license for (nearly) free. 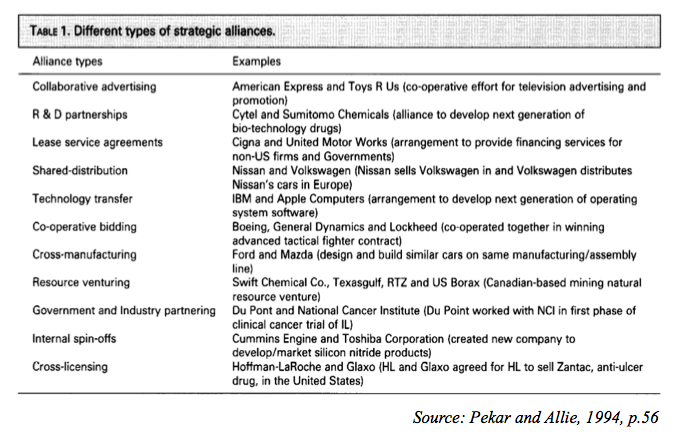 In these setups partners contribute to each other’s business models like in the barter relation. At the same time one of them also profits from the customer value proposition as a customer of the other. You find these patterns mostly in matured online platform business models. The sheer volume of traffic that the platform generates is of value to businesses that want to sell something, and they’re wiling to pay for access. The App Store platform is such an example. App developers market apps in partnership with Apple, and split the revenue @ 30% for Apple. At the same time developers are customers through their yearly payment for the SDK app developers’ kit.Amazon Marketplace is another partnership example that shows the hybrid partnership pattern, and a special one called coopetition. Book vendors are partners because they complete the experience of multiple options in book offerings (new or second hand hard cover or paperback, or e-book) to Amazon’s customers. At sale they agree to split on a commission for Amazon. Yet, at the same time vendors are also competitors with their competing book title offerings. As customers, vendors pay for using Amazon’s web service channel in their business model through a vendor subscription. The joint venture is a curious beast. It’s actually not a partnership in the sense of value exchange between two independent business models. A joint venture is a business model by itself, where two or more companies have decided to combine their resources. The reasoning behind creating a separate business model is that there are many elements involved in the collaboration, and the outcomes are too complex to attribute rewards and contributions to each partner separately. Often you’ll see founders of the joint venture, acting as partners in the joint business model. Examples of famous joint ventures are the Starbucks-Pepsi partnership for canned cold coffee drinks, or the Philips-Douwe Egberts joint venture for the Senseo coffee machines. A partnership is defined when value exchange takes place between 2 independent business models that goes beyond the transaction relationship. The vendor relation is not a partnership as it only involves the shifting of ownership of goods or information. Only when the strategic importance of a vendor increases to your business model, will the exchange of value beyond the transaction start to make sense, and will a partnership come to life. The barter and hybrid partnership types enable continuous value exchange between business models, whilst they still keep running independently. These are flexible business model innovations, and can create tremendous competitive advantage. The joint venture also contains strong innovation potential, but is less flexible in setup. Partners bind themselves to the success of the joint business, and ending of the relation will most likely entail ending of the business. The key for business model innovation through partnerships is both in finding the purpose of your partnership, as well as the mode of value exchange with your partner. The business model canvas will help you find out why you would need a partnership. The partnership canvas will help you figure out why your partner would also need one with you, and how and in what shape these two innovation imperatives can be linked together.